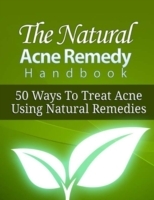 &quote;Discover the 50 Proven Ways To Treat Acne Using Only Natural Remedies. &quote; Acne is a skin disease that involves the oil glands found at the base of hair follicles. These glands come to life during puberty due to both male and female hormones produced at that time. Because of these hormones, this is the time acne usually occurs. Acne occurs when the oil glands at the base of hair follicles get blocked and oil accumulates under the skin. It's frustrating when you feel you don't have control of what is happening to your face. People try everything over-the-counter and take every medication their dermatologist gives them and still have terrible acne breakouts. Inside this guide, you'll discover: 1. 50 ways to treat acne using natural remedies.